Golden Bird is a card game between you and computer using 52 cards of standard four suits containing hearts, clubs, spades, and diamonds. Instructions along gaming are available to let you know better how to play this kind of card game. Clear your cards before opponent does. When no card in hand to throw, you must take more cards from the card decks. 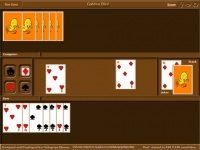 Free solitaire card game collection that includes twelve Solitaire games.